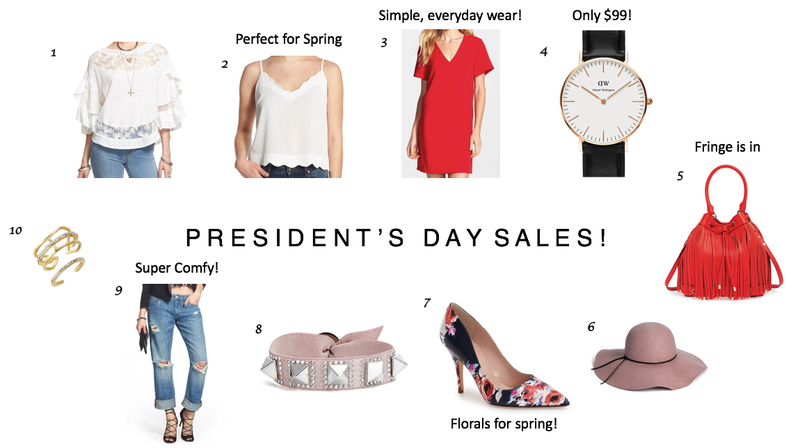 President’s Day sales are always so great because they fall right in the middle of late winter/early spring, which makes it a perfect time to purchase a few items to add to your spring wardrobe. I’ve picked sale items from Nordstrom but there are several stores with sales today. You can find a list of them below. I’ve also gone through each of my sale items and discussed why I chose them. Take a look! Ruffles & Lace | This top is so darling. I love the lace and ruffles on the sleeves. This will pair perfectly with skinny distressed denim, colorful capris, or a pencil skirt (if you need to dress it up!). Scalloped Cami | Cami’s during spring are a necessity. Here in Seattle, we always have to layer because the weather can change at the blink of an eye. This top would look great underneath a bright sweater and adds texture with the scalloped look at the bottom. Red Dress | I saw this dress and had to have it. It’s simple, bright red, and can be worn 100 ways. How fun would it look with a pair of converse and your jean jacket? Or with a pair of floral heels and a statement necklace? Both outfits would look great and span from casual to dressy. The Daniel Wellington | I’ve seen this watch on so many people and I have to say, I love it. It’s simple, neutral, and has a large, boyfriend look, which I love. There are two styles on sale right now for $99 and $85. Great price for a great statement watch! Fringe, Fringe Fringe | I don’t know about you, but I have been loving fringe. Especially on handbags and accessories. This purse is (a) bold, (b) has that bucket bag look (which I love for spring! ), and (c) can be worn multiple ways. Blush Hat | Blush is such a gorgeous color and goes with just about every outfit. You could wear this hat in the spring, summer, fall, or winter. All year! If you’re looking for a hat like this, head to Nordstrom. They have quite a few on sale in all colors. Floral Heels | I love shoes, especially shoes with fun designs like this one. To me, these could be worn year round as well (just like the hat above!). The floral print is perfect for spring time and can be paired with dresses, skinny jeans, or even shorts. The black undertone makes it a perfect shoe for every season. Simple Bracelet | This rockstud, blush bracelet is adorable. When I saw it, I thought it was so sweet, can be paired with your watch or other bangle bracelets. Distressed Denim | I love these pants! I have a pair of Blank NYC ripped denim and I’ve been wearing all weekend. They are super comfortable and have a perfect distressed look. These are on sale now, so head over to Nordstrom.com and add them to your cart! Delicate Rings | When I think about Spring, the few words that come to mind are – soft, delicate, blush, sweet, and (on the contrary) bold – and that’s why I’ve picked many of the items above. These rings are another example. I don’t have any delicate and dainty rings like this, but they can add a simple accessory to your hand. If you are not a jewelry person, these rings would be a great start. Here are other sales going on today. If you have the day off, you may want to hit the mall! Saks Fifth Avenue | Last Day Final Sale – Up to 75% off In Stores and Online.